The latest regulation changes that impact how you determine which positions are "overtime eligible"
Your state law says one thing and the federal government says another — now what? With this payroll management training workshop, you'll learn how to better interpret state and federal wage and hour laws and, most important, how to keep your company out of hot water with the DOL and state agencies. Everyone makes mistakes. Auditors and investigators are charged with catching and cleaning-up these error. Together, we'll make sure you are prepared with an impressive level of “good faith” efforts that turn a potentially expensive audit or lawsuit into a much less costly educational experience. 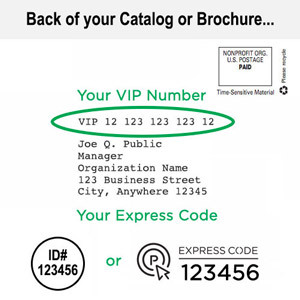 Payroll processing sounds like a simple proposition. Employees work at a certain rate of pay. You take out taxes and give them the rest of what they've earned. Sounds like basic math, right? Unfortunately, the Department of Labor’s wage and hour regulations regarding worker classification, minimum wage, overtime and what actually constitutes “hours worked” can be confusing and do not rely solely on “math” to determine compliance when conducting an audit. When you add in the various IRS requirements surrounding taxation and the proper view of government “trust fund” monies a simple task turns into a legal landmine. With this payroll law seminar, you'll gain strategies to handle payroll accurately, legally and with complete confidence. What you don't know can hurt you. That's never more true than when dealing with payroll law. The first step to complying with regulations is understanding them. 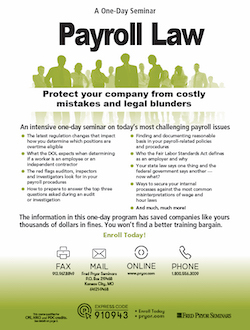 You'll begin your class with a crash course in payroll's legal basics. Find out what areas fall under state, federal and joint regulation and learn how to avoid the often staggering penalties and fines of non-compliance. Exempt vs non-exempt employees – What’s the difference? Worker Classification: Employee or Independent Contractor - How to Decide? What is back-up withholding and when should you use it? Tips and uniform allowances — what's considered income, what's not? Cell phone supplements – taxable or not?